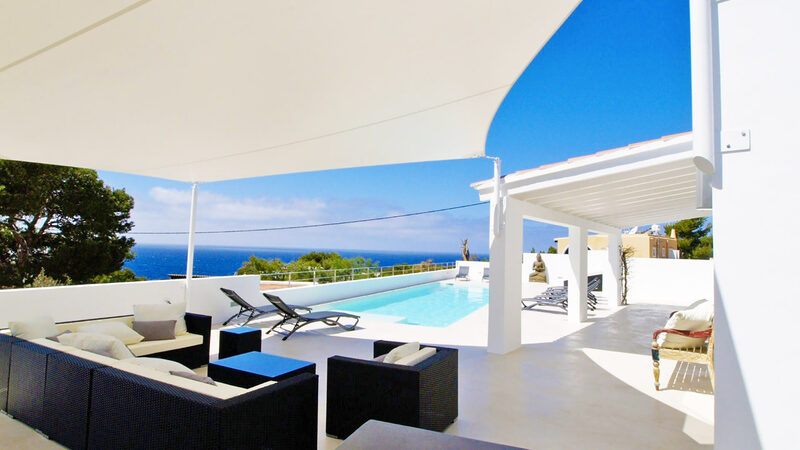 Modern minimalist style villa, located on a hill, 200 meters from the beach of Cala Codolar. Very comfortable house perfect for a holiday with a group of friends. Room, Ground level, direct access to the terrace. Bathroom ensuite, private, with shower. This bedroom includes also air conditioning, TV. Room, Ground level, direct access to the terrace. Bathroom ensuite, private. This bedroom includes also safe. Room, Ground level. Bathroom ensuite, private, with shower. This bedroom includes also air conditioning, TV. The most beautiful beaches on the island are all between 5 and 15 minutes by car: Cala Conta, Cala Bassa, Cala Moli or Cala Vadella. Walking distance from Cala Codolar beach. Ibiza town is 20 Km away, San Jose and San Antonio are both 5 miles away.